Up until a few months ago, I had lost my energy and motivation at work. I was slacking off and procrastinating, and my work was piling up (fortunately for me, my senior was on maternity leave). But here’s the thing, the reason for my increasing disengagement from my work was not because I didn’t love what I was doing or I despised my team or my office; the reason was me. I was losing my appetite for work. I was disorganized, unproductive and, well to be honest, kind of bored. At one point I remember Googling solutions for the rut I was stuck in. It was then that I discovered some methods of visualization that could help me out. What does visualization has anything to do with improving my productivity? I was skeptical too, until I really tried out these visualization methods that I’m going to share with you, hoping they will help you be more efficient at work too! I’m a writer. My head is an idea factory. Believe me, I may have tried several ways (to no avail, of course) to organize the ideas that shoot out of my head when I’m working on marketing campaigns. I would list them down, go over them in my head, try to memorize them…but this wasn’t exactly very successful. A mind map is this way of visually organizing the idea sprouting in your head. It’s not necessarily art, but more of an artistic way of laying out an idea, strategy or an entire marketing campaign. It begins with the name of your idea in the middle of the map. Then you branch it out as you slowly develop it into a strategy that can be realized. A mind map can also be used as a technique to solve a problem, make a decision or even to plan out something like an event or your daily work schedule. A mind map is a combination of visual, color and visual-spatial arrangement, which help memorize information better. This combination of elements also helps with gaining a better overview of the idea in question, and that helps with generating new ideas or solutions when mapping out a strategy. 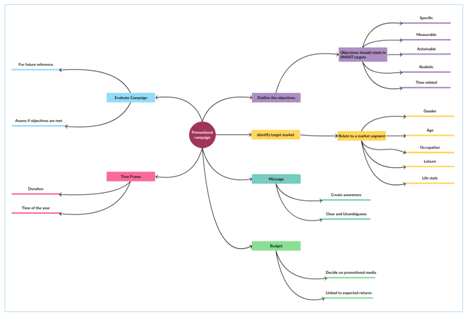 Using mind maps has not only rekindled my passion for coming up with unique content marketing strategies, but has also made my day more productive, for I use a mind map to plan the daily tasks every morning, and it has restored order to my routine. Flowcharts are this great way of visualizing the structure of a process. What is the point of visualizing the flow a process? I asked myself the same question as I drew a flowchart of our visual content marketing strategy. This did not only help me clarify a few areas I was previously a tad bit confused about, but it also helped me figure out where I should make improvements. Now this isn’t the only purpose of a flowchart. Flowcharts can also be used for (strategic) decision-making and even planning. Say you have to make a choice between two alternatives; a flowchart helps you figure out what the better alternative is, hence accelerating the decision-making or the problem-solving process. I would say that it is similar to listing down the pros and cons of the available options, except a flowchart is more effective in the sense that it allows you to contemplate the alternative more thoroughly and guides you to make the right choice. Now I always use flowcharts when I want to clarify the flow of a strategy or a campaign process to my senior or a colleague. This way it’s more efficient because it leaves me with less explaining to do (as the flowchart pretty much is self-explanatory and simplifies the process through visualization) and I’ve got a guide to give me direction and keep me on track throughout the entire project. Imagine how easy it is when you have all the important project details, like the different tasks, duration of these tasks or whether they overlap each other etc., in one place for a quick overview. Now stop imagining and use a Gantt chart because this is exactly what a Gantt chart does. Plus it also lets youtrack the progress of each individual task. Remember I told you how I was disorganized and my work suffered because of it; I was referring to the way I handled the projects at the time. I used to work on various tasks assigned to me at different times and I didn’t track their progress or completed them properly. This eventually resulted in the delay of several projects I was working on (gladly, I was in charge of the projects and they were not urgent). So I incorporated a Gantt chart. At first it was just an experiment, but then the results were just amazing, so I decided to adopt the method permanently. A Gantt chart lets you break the project in to several smaller tasks (which you can further break down), and as you work on them, you can mark down the progress you make each day or week. This way you can set accurate deadlines and monitor the progress you make. That’s right. Initially I thought that organizational charts are just for visualizing the hierarchy of a company too. But, not only an org chart can be used to illustrate the job roles and the responsibilities of the employees, but they can also be used to clarify the reporting structure within the team or the organization. If you are new to the company and have no idea who is who and what they do, an org chart could literally be a lifesaver. The new SEO specialist, who joined my marketing team just last week, swears by this.And yes, I recommended it to him. A comprehensive org chart of the company is also plenty helpful when planning a project. Since the org chart visually highlights the roles and responsibilities of everyone in the company (I usually also mark down the project schedule of everyone in the team on the org chart itself), it is easier when assigning tasks or setting up deadlines. This saves you time when allocating resources and selecting competent people for the job. A fishbone diagram, also known as the cause and effect diagram, is a great tool when you are brainstorming possible causes for a problem. It’s a method that drives you to ask the question ‘why is this happening’ at every possible turn, hence making sure that you have scrutinized every alternative cause of the problem at hand to find the best solution. Solving a problem for me used to be finding the solution to what seemed like the most obvious cause when an issue popped up; on days I would now like to consider as lucky, this worked, but on other days, it was just a temporary fix if not the worst solution I could ever come up with. However, a fishbone diagram doesn’t let you be sloppy with problem-solving, because it gets you to look in to the issue more thoroughly, deconstruct it to a bunch of causes until you get your finger on that one cause that is responsible for the effect. This is a great way to structure brainstorming session, and compared to simple list making or note taking, this method is more effective. It was obvious, what I wanted to gain my energy and motivation back and to restore order into my disorganized work schedule was a systematic approach. With these visualization methods, I was able to do just that. Go ahead and try them out, and share your own experience with increasing workplace productivity through visualization in the comment section below. Amanda Athuraliya is the communication specialist/content writer at Cinergix, the team behind the development of the organizational chart software, Creately. She is an avid reader, a budding writer and a passionate researcher who loves to write about all kinds of topics.